The Defender helps citizens of the European Union who live or work in another member state and promotes equal treatment regardless of their nationality. Thanks to European Union every member state designated one or more bodies which provides help to EU citizens abroad and thus contributes to the full exercise of free movement of EU citizens. The list of the bodies is available at European Commission webpage . The Defender is the designated body in the Czech Republic. The Defender may be contacted by people who faced unequal treatment on grounds of their nationality and who are EU citizens (i. e. citizens of a member state of the European Union) or members of their family (even if they are not EU citizens themselves). Citizens from countries of the European Economic Area (Norway, Iceland and Lichtenstein) enjoy the same rights as EU citizens. Antidiscrimination Act (173.6 kB, Adobe Acrobat document) prohibits discrimination of workers (employees) from other EU member states and their family members primarily in access to employment and conditions of employment, especially as regards working conditions, remuneration, promotion, health and safety at work or membership in trade unions; further also in the access to social and tax advantages, training, housing and as regards assistance afforded by the employment offices. The aim of the Defender in this field is to facilitate the free movement of workers across European Union. EU citizens have the right to move freely to another member state in order to work there and they have the right to be treated equally as nationals of that state. Free movement of workers is guaranteed in founding treaties – in the Treaty on the Functioning of the European Union and is further specified in subsequent legal acts. 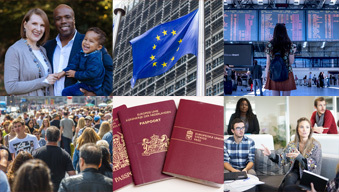 EU citizens and their family members enjoy the right of equal treatment as regards access to employment, conditions of employment and work, in particular with regard to remuneration, dismissal, and tax and social advantages. The Defender acts as a contact point for people who face problems in above specified areas. The Defender can also deal with cases submitted by persons who are not Union workers (person with income from other sources than employment, students, etc. ), even if they don’t enjoy the right of equal treatment in all cases. More information on how the Defender may assist you is available here (572 kB, Adobe Acrobat document).